The University of Redlands Mortar Board Honor Society has announced that Alana Belcon, who teaches spatial studies in the College of Arts and Sciences, has been named Professor of the Year. “The Mortar Board Professor of the Year ceremony provides a chance to celebrate University of Redlands professors for everything that they do,” says Griffin Doran ’19, who sits on the ceremony’s planning committee. Nominations for the honor were collected from students in December. It is Belcon’s second year teaching at the University of Redlands. 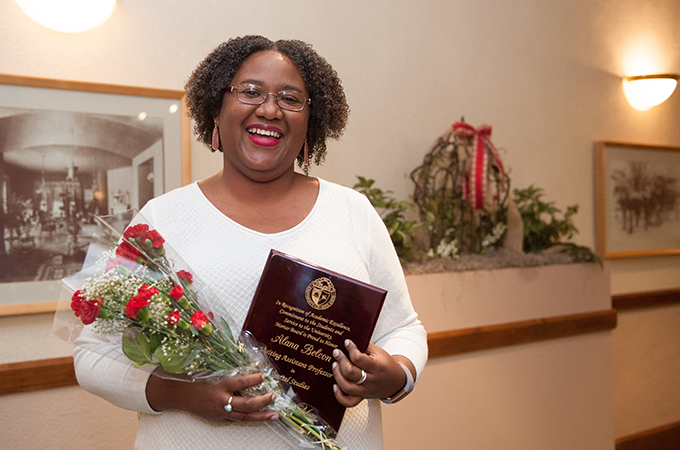 A graduate of Mount Holyoke College (B.A., environmental studies) and Duke University (Ph.D., tropical limnology), she has spent 18 years working in geographic information systems (GIS) and education in both the United States and her home country of Trinidad and Tobago. Her position at the University merges her scholarly interests and expertise teaching others how to use GIS and think spatially. “Professor Belcon developed an idea for a first-year academic experience, where students were immersed in the world of GIS and were able to bond with other students in their cohort,” said Liran Koropitzer ’19 at the February 13 event, before reading testimonials from Belcon’s students. This was the 61st year that Mortar Board undergraduates honored a distinguished faculty member who embodies the group’s ideas of scholarship, leadership, and service. Mortar Board began at the University of Redlands in 1943 as a women’s senior honorary group, known as W.E.B.S., Wisdom, Excellence, Belief, and Service. In 1955, it became recognized as an official chapter of the Mortar Board National Senior Honor Society, and, in 1975, membership was opened to both men and women. This year’s Mortar Board finalists for Professor of the Year also included Biology Professor Ben Aronson, Creative Writing Professor Francesca Block, Chemistry Professor Michael Ferracane, and Economics Professor Nicholas Shunda. Learn more about the Environmental Studies Department and the College of Arts and Sciences.